Houston educators visit Saudi Arabia in a remarkable, nine-day tour hosted by the Saudi Aramco Public Relations Department. Delegates, three-quarters of whom are K-12 Grade teachers from Houston, Texas, will experience the Kingdom first-hand in an extensive, guided tour from May 30 through June 8, 2004, in Saudi Aramco's continued efforts to support global education on Saudi Arabia. 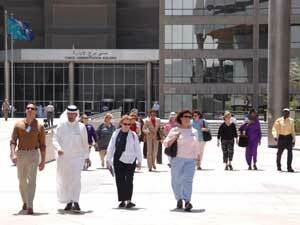 This tour marks the first of its kind for Aramco, inviting K-12 grade educators to Saudi Arabia. The tour was initiated by Aramco Services Company, Houston, while working with the Institute of International Education (IIE) on the Cultural Navigators Project Mobile Trunk Lending Program. Educators were selected by Houston County Social Studies Leadership and will be returning to Houston to share their experiences with students and other educators from their schools. 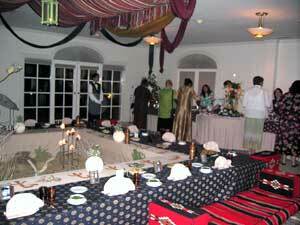 For more information on Houston Educators and Tour Coordinators, see Houston Educators Visit Saudi Arabia. 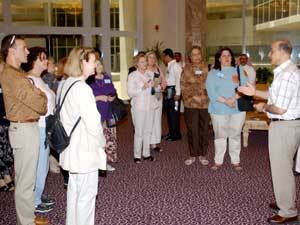 Educators arrived on the evening of May 30, at the Bahrain Airport then were shuttled to Steineke Hall, Dhahran for check in. 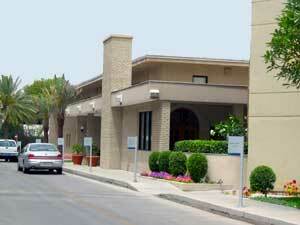 Steineke Hall is a modern, two-story building of cement brick construction located near the Dhahran Dining Hall. It was named after the legendary pioneer and chief geologist Max Steineke who is credited by colleague Phil McConnell to have "discovered more oil than anyone else in the industry." 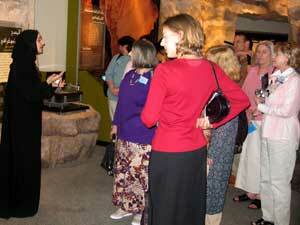 On Monday, May 31, educators again met at Steineke Hall for an early morning departure to the Saudi Aramco Oil Exhibit. 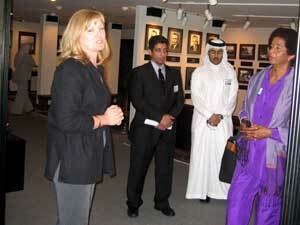 At the exhibit, educators were received by Abdulla I. Al-Isa, Manager, Public Relations Department. Manal A. Al-Hazza, Public Relations Department, welcomed the group. The Saudi Aramco Exhibit is Saudi Arabia’s first major science museum featuring the history of Aramco, oil and gas operations, and the history of Arabic-Islamic technology. The exhibit is a fascinating journey through history from petroleum’s origins in the ancient seas, through underground rock formations and desert drilling operations, into refineries and marine shipping terminals. 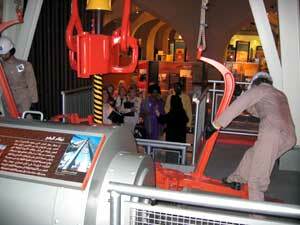 The Oil Exhibit was established in the 1950s with the latest upgrade completed in 2000. It now incorporates state-of-the-art technology that provides automated and computerized exhibits for hands-on learning about the perpetual and fast-paced development in the oil and gas industry. While at the Saudi Aramco Exhibit, guests were given an overview of Saudi Aramco, then watched a magnificent 3-D film entitled Saudi Aramco – Energy to the World. The film can be presented in 16 different languages. Following the film, guests received a tour of the exhibit conducted by Manal, observed a simulation of Saudi Aramco’s state-of-the-art Operations Control Center, and stepped into a life-size model of a shipping vessel’s control room to experience the exhilaration of discovering, harnessing and distributing energy to the world. The Arabic and Islamic Technical Heritage display is the centerpiece of the exhibit, describing the tradition in which the modern petroleum industry is founded. While in Dhahran, guests were given a tour of Saudi Aramco’s Exploration and Petroleum Engineering Center (EXPEC) by Dr. Ahmed A. Metwalli, Manager. In 2002, 20 years since EXPEC’s official inauguration by King Fahd ibn ‘Abd al-‘Aziz, Sulaiman A. Al-Fassam, Vice Presdient of Petroleum Engineering and Development was quoted, “No other center has played such a pivotal role in making Saudi Aramco number one in worldwide production”. Guests watched the film, EXPEC 20 Years of Excellence, honoring this remarkable facility. EXPEC houses Saudi Aramco’s four 3-D visualization facilities. These facilities process seismic data to map the layers of rock found deep beneath the earth’s surface. Careful analysis of the data will show porous layers of rock where oil and gas get trapped and can provide engineers with beneficial data prior to drilling. Geologists also use the data to identify new oil and gas reservoirs as well as extend the producing life of existing reservoirs. The delegation continued their tour at Saudi Aramco’s Oil Supply Planning and Scheduling Center (OSPAS). It is here that Saudi Aramco monitors and controls the entire Kingdom’s oil and gas production, distribution, refining and shipping. Guests were received by Abdulla Al-Ghamdi, Manager, OSPAS. Cindy Grosch gave an informative guided tour. She started with a prominent feature of the gallery, a photo guided timeline outlining Aramco's history. Guests of the Heritage Gallery are invited to enjoy the vast resource of publications maintained in the gallery library and reading area, or choose from a list of Saudi Aramco films dating back to 1938 for viewing in the audio visual room. A short walk through the gallery courtyard leads guests to the Pioneer Exhibit to embark on a voyage of discovery in the footsteps of Aramco's pioneers, and witness the extraordinary events that would shape the future of Saudi Arabia. After visiting the Gallery, the educators walked across the street to the Dhahran Library where they learned about Saudi Aramco's library system. They were also informed that the present day library was the original Dhahran school built by Aramco. The educators were then taken on a bus tour of the Dhahran Camp including King Street and Hills Recreation Centers, the Hobby Farm and the new Rolling Hills Golf Course. The men in the party had a wonderful traditional Arab dinner at the Heritage Gallery while the female guests were honored to attend a dinner hosted by Mrs. Jum'ah, former teacher and wife of Abdallah S. Jum'ah, President and CEO, Saudi Aramco. Read more articles on the Houston Educator's Tour and visit the Galleries.